Amala Paul was last seen in Ratsasan opposite Vishnu Vishal which was received well by fans and critics. She has now become a part of a thriller and that is not the only exciting update about her. 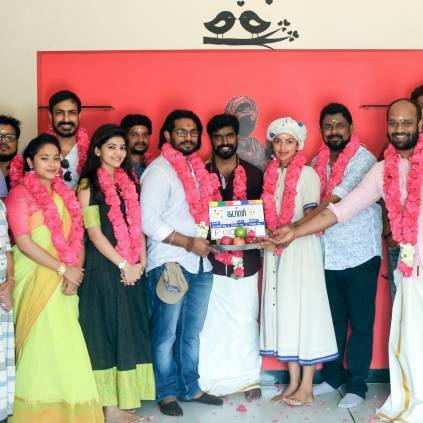 Amala Paul is now donning the producer's hat for the first time. Titled Cadaver, this movie will have her manager, Pradeep as the co-producer. This is announced to be a forensic investigational thriller. The film was launched today with a pooja ceremony. The cast includes Athulya Ravi, Harish Uthaman, Ramesh Khanna, Vinodh Inbaraj and others. The movie has music by Jakes Bejoy, cinematography by Aravinnd Singh and editing by San Lokesh. Amala Paul sported a turban makeover during the pooja ceremony. More details on this productional venture of Amala Paul are expected to be announced soon. Kerala Floods: 'கையில் கட்டுடன்' களத்தில் இறங்கிய Amala Paul! People looking for online information on Amala Paul, Aravinnd Singh, Athulya Ravi, Cadaver, Jakes Bejoy, Producer, San Lokesh will find this news story useful.